WASHINGTON -- The Senate on Tuesday confirmed Portland lawyer Michael Simon to be Oregon's next federal judge, ending a journey that was both longer and bumpier than expected and one that lawmakers said highlighted the dysfunction gripping the nomination process. Simon cleared the Senate on a 64 to 35 vote. The divided outcome on a nominee who was praised as a legal authority and highly qualified, reflected the slow and frustrating pace as well as the sharp partisan nature of nearly all confirmations. Simon, who has his law degree from Harvard and spent time working for the Justice Department as well as a long association with the American Civil Liberties Union, had a long and distinguished career in private practice. That background won easy confirmation from the Senate Judiciary Committee in February by a lopsided 14-4 vote. It was the second time the committee endorsed him. He was originally nominated in 2010 and approved by the Judiciary Committee. But his nomination died when the Senate failed to bring it to the floor for a vote before year's end. He was re-nominated by President Barack Obama early this year and again endorsed by the committee. In earlier days that would have meant a fast vote on the Senate floor. Not now. When he was finally confirmed on Tuesday, Simon had spent more time waiting for a final vote than any other candidate approved by the Senate, Judiciary Committee spokeswoman Erica Chabot said. "Traditionally," Judiciary Committee Chairman Patrick Leahy said from the floor Tuesday, a lopsided committee vote would mean "a vote on the Senate floor almost the first day after he was reported" from the committee. "It should not have taken more than four months after Mr. Simon had been approved for a second time," Leahy said, describing the current climate on nominations as "unseemly." The problem was in the numbers. While the committee vote was emphatic, Republicans generally said they would allow only nominees who won unanimous approval to move to the Senate floor. The four opposing votes from Judiciary -- all from Republicans -- meant that Senate leaders would be forced to negotiate a deal to bring his name to the floor. That process too months. The delay was all the more frustrating because the federal court system in Oregon has been given emergency status. The declaration is issued by Chief Justice John Roberts and means filings per judge exceed 600. Moreover, the seat Simon now fills has been vacant for 664 days. Despite the delays, Simon was widely considered to be both qualified and competent for the lifetime job as federal judge. "Quite simply, Michael Simon has the integrity, the intellectual breadth and depth and good old fashioned common decency," Sen. Jeff Merkley, D-Ore., said from the Senate floor prior to the vote. "Michael Simon exemplifies the traits every single federal district judge should possess," he said. Sen. Ron Wyden, D-Ore., who followed Merkley to the floor, concurred. "Michael Simon is one of those persons, when you look at the kind of jurist you want, meets all the essential tests." Nonetheless, Simon was sidetracked for a year by larger conflict over nominations in general and a sharply partisan Senate that operates by unanimous consent. That means if a single senator - from either party - objects a nomination remains bottled up until those issues are addressed. "I see no end to it," Merkley said of the tortuously slow pace of nominations. "It's a deliberate process of slow walking nominations and it doesn't serve America well." Simon's elevation to the federal bench came three months after the Senate filled another open seat in Oregon by confirming Marco Hernandez. His experience was even more wrenching than Simon's. 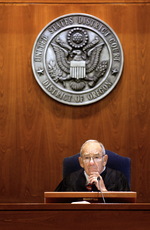 Hernandez was first nominated in 2008 to be a U.S. district court judge by former President George Bush after earning endorsements from then-Republican Sen. Gordon Smith and Democrat Wyden. Despite bipartisan support, the Senate failed to act on his nomination. Hernandez had to be nominated two more times before finally winning a vote on the Senate floor, where he was easily approved.